An Australian associate professor has observed that Vietnam’s research culture is progressing in the right direction even though many Vietnamese and foreign academics have recently been pointing out and criticizing a lack of research. This is one of the many conclusions of Dr. Stephen H. Moore, an associate professor from Macquarie University in Sydney, after he has studied the research culture in Vietnam at several higher education institutions over the last five years. But he admitted that the current lack of research has a negative impact on both the institutions and their students’ experience. The results and observations were stated at the International Conference on English Language Teaching 2018 (ICELT 2018) organized by the Faculty of English Linguistics and Literature under the University of Social Sciences and Humanities in Ho Chi Minh City on November 23, as well as other important changes in the research attitude of academics at the universities. Insufficient research is a common issue at Vietnam’s higher education institutions despite the increasing number of faculty members earning master’s and doctoral degrees in Western countries. Very few conduct research beyond minimal contractual expectations, which represents a missed opportunity to contribute to the development of Vietnam’s human capital, according to Associate Professor Moore. Some are recorded not to have published any academic papers or journals in a few years, and others have not engaged in any form of research for long periods of time. One of the most common obstacles researchers in Vietnam face is the lack of time, according to Moore’s recent study. Most teacher spend vast amounts of time teaching at other institutions and working on other projects that might provide them with an extra income, as insufficient salaries do not allow teachers to live comfortably. Research is something of a luxury to college lecturers here, the Australian academic said. “The question to ask is, ‘If teachers were paid a sufficient salary to live comfortably, would their research activity increase, or would they still be seeking more teaching opportunities to earn more money?’” he added, indicating that it is reasonable for teachers to take on extra teaching in order to survive economically. Moreover, the institutions also lack the incentive that promotes and requires lecturers to conduct their own research. Some of the incentives commonly found at Western universities would be awards, promotion and prestige; negative ones include being faced with an increased teaching load if research activity is too little, or even eventually losing one’s job, according to the professor. Another reason of note is the difficulty teachers have in accessing the relevant literature to conduct their research. It is of utmost importance that the researchers can obtain up-to-date literature in order to build the foundation. “Books and academic journals are expensive to purchase or subscribe to. It is a question of money,” Dr. Moore said. When evaluating a school’s reputation and credibility, research is one of the deciding factors, which can be seen through the fact that most globally prestigious universities are also favored research institutions, such as Oxford University in London, Princeton University, or Harvard University. Research is not only important for the general development of a society, but it has also been proven to play a vital role in teachers’ credibility and capability. 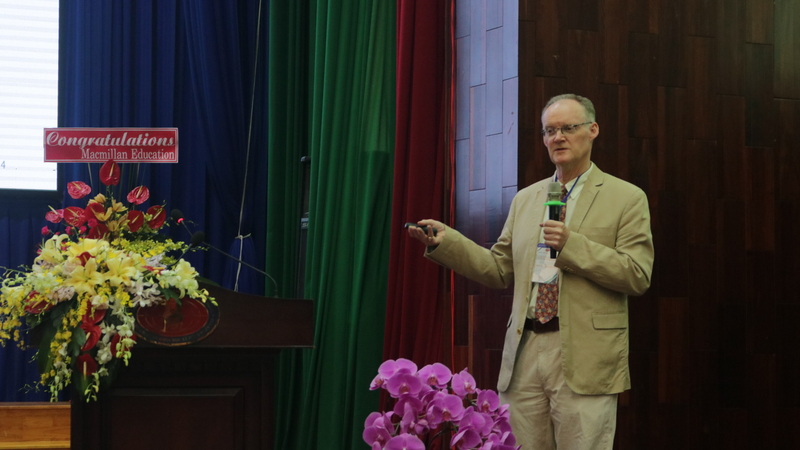 The Macquarie University professor also emphasized at ICELT 2018, sponsored by Yola Institute, Oxford University Press, Macmillan Education, and Kototech Company, the importance of higher education institutions focusing on doing more research as an ideal way to improve the quality of universities. “Research is where ideas come from,” Moore remarked. According to the professor, researching forces teachers to read and study relevant literature, avoid the risk of teaching the same thing every year, and the lack of excitement because without new findings, the teachers will not be as enthusiastic in putting them into practice. “It is an organic ecosystem where we stay alive as teachers and alive as students,” the professor added. Despite the setbacks education in Vietnam is facing, the academic stated the Southeast Asian country is moving in the right direction. Even though the reality might not be the same, most universities currently address the importance of research as a part of a lecturer’s mission at the institutions. “This is the first important step. Without this awareness, nothing further is likely to happen,” Moore said. Having spent over two decades working with Vietnamese lecturers, the professor noticed several positive changes in their attitude. “The lecturers have a better initial understanding about research, and I think they’ve become more efficient as researchers, more quickly than, say, 10 years ago,” he observed. His research suggested that even though no “imaginative” approaches and research topics have been witnessed, most lecturers have a good understanding of what their research may be and how it should be conducted thanks to their study abroad experience. Dr. Stephen H. Moore is an associate professor in the linguistics department at Macquarie University in Sydney, Australia, where he has worked in the fields of English language teaching and other related areas for almost 30 years. Throughout his career, he has come to Vietnam several times, beginning in 1994. He conducted two researches on English language teaching in Vietnam in 2013 and 2017, while also working closely with many Vietnamese master’s and PhD students at Macquarie University. He has published widely in top journals and has co-authored two books of the Palgrave Macmillan publishing company, which are Language for Specific Purposes (2015) and Exploring Discourse in Context and in Action (2017).